Photo courtesy of zimbio.com. Peyton Manning (pictured above) will make his anxiously awaited debut as the quarterback of the Denver Broncos in his first real NFL action in over 20 months. The NFL is back in full force after Wednesday night’s opener between the Giants and Cowboys. It is still odd to me that an NFL game was played on a Wednesday, but life goes on. Keep in mind that the last three times the Giants and Cowboys have played each other in their opener, one of the two NFC East rivals has gone on to claim the Lombardi Trophy. Let’s hope the real referees return by then. Two seasons ago, I created a pick’em challenge with one of my good buddies (CV3). Last year, we added two new players (CB and DC) to increase the competition level of the second annual “TheSportsKraze Pick’em Challenge.” In year three, we have replaced last year’s cellar finisher (DC) with a new player (BD) that will surely be in the hunt. BD-Brien Dulle: A life-long sports fan that has lived all of his life in Cincinnati. Growing up as a sports fan in a tough city for professional teams (Bengals and Reds), Brien never developed strong allegiances for any one particular team. This unbiased vantage point gives him a much broader range of the sporting world. His opinions from sports have been greatly influenced by the likes of individuals like Colin Cowherd, Scott Van Pelt, Ryen Russillo, Tony Kornheiser, and Michael Wilbon whom he listens to daily. CB-Craig Baker: A former collegiate baseball player and current special education teacher. CV3-Chad Vordenberge: An elite high school wide receiver and a very successful business owner. TSK (two-time defending champion)-Josh Kramer: Founder/Editor-in-Chief of “TheSportsKraze,” former ESPN intern, current Sunday columnist for the popular SNY Network Blog “It’s About The Money,” and writer for fantasy sports website DraftDay.com. Photo courtesy of zimbio.com. 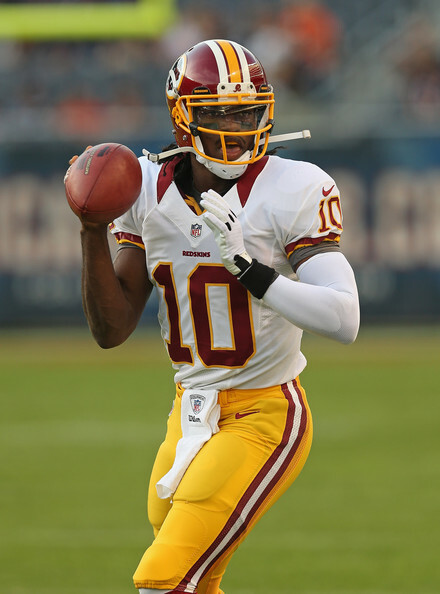 Could Robert Griffin III (pictured above) help transform the Redskins from a pretender into a contender? Our very own Jeremy Powers thinks so. The football season is upon us. Put a smile on your face. Tonight, the Giants travel to the Jerry Jones Dome to revive the rivalry that received plenty of media attention as is typically the case this offseason. I can’t wait to see which teams will take a step back and which teams will rise from the ruins and contend for a playoff birth. Let’s look at a recent example, shall we. Last season, Tampa Bay stepped back from a ten-win season in 2010 to a 4-12 record and a last place finish in the NFC South. Ouch, talk about the opposite side of the spectrum. The Bucs were a pretender last season. Cincinnati, who won four games in 2010—reached the playoffs with rookies leading the way on offense. Andy Dalton and A.J. Green made a formidable duo and the Bengals defense was stout all season long leading the team to a 9-7 record. The Bengals were a contender last season. This season I expect some of the same parity that we see every season in the NFL. I see a few teams emerging as playoff contenders and some teams falling straight into the depths of their respective divisions. Photo courtesy of zimbio.com. 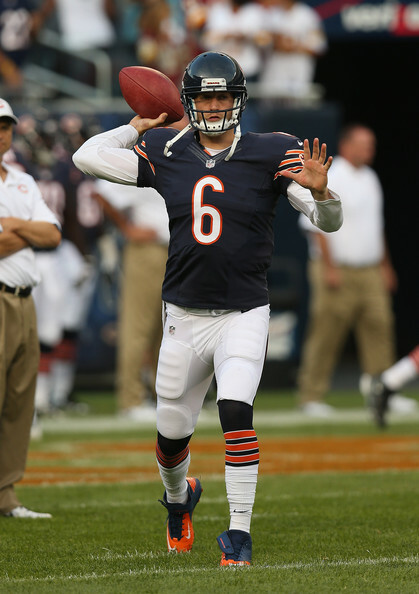 Are Jay Cutler (pictured above) and the Chicago Bears poised for a big year in 2012? Our very own Wesley Kaminsky thinks so. The NFL off-season always seems too long, doesn’t it? In an off-season dominated by Tim Tebow and the New York Jets, it’s that other team in New York who are the reigning Super Bowl champions. They shocked the NFL world a season ago, getting hot at the right time, beating the likes of the Packers, 49ers, and then eventually the Patriots. That takes guts. With teams such as the Packers, 49ers, Bears, Saints, and Falcons, just to name a few, the NFC is becoming a powerhouse. I didn’t even touch on the NFC East. In the AFC, the Patriots look like the clear-cut team to beat, as they added more weapons to an already lethal offense and revamped their defense. Can the Ravens finally get over the hump? Will Peyton Manning return with a vengeance? Photo courtesy of zimbio.com. 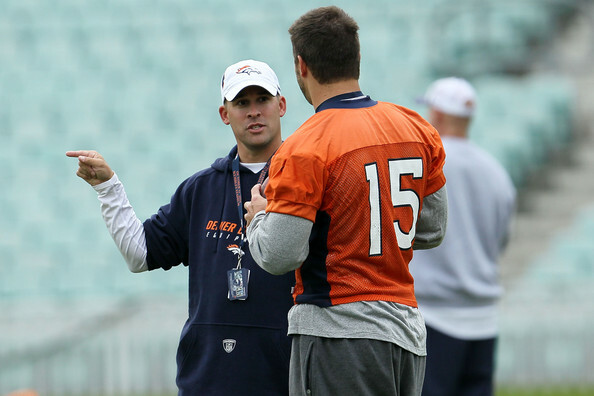 Tim Tebow (right) was always Josh McDaniel's (left) guy. That fact has been fully brought to light with Peyton's arrival in Denver. It’s no secret that the biggest question of the NFL off-season has been where Peyton Manning will land. After missing the entire 2011 season with a neck injury, the Colts decided to part ways with Manning after 14 seasons in Indianapolis. After much deliberation as to where Manning would choose, it was announced that he would be going to the Denver Broncos, and they rewarded him with a 5-year, $96 million deal. Photo courtesy of zimbio.com. Now we all know where Peyton Manning will be playing in 2012. 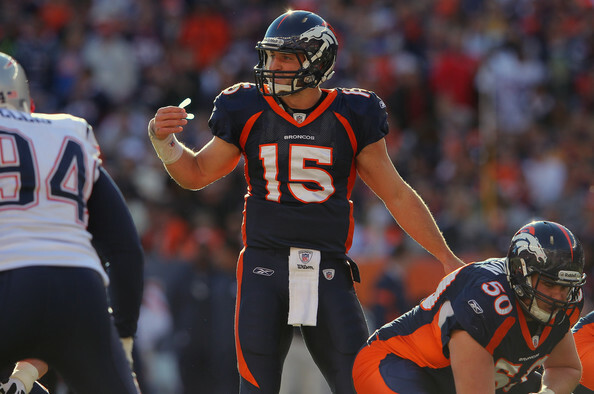 Where will Tim Tebow (pictured above) land? #18 is taking his talents to Mile High. This whole “Decision” had a far different feel than the infamous “Decision” of July 8, 2012. Peyton Manning handled this whole situation with the amazing grace and class that he has demonstrated throughout the duration of his career. He is heading into a good situation in which punching a ticket to the playoffs in year one should not be a problem. At nearly the age of 36, all Peyton wants to is win Super Bowls. 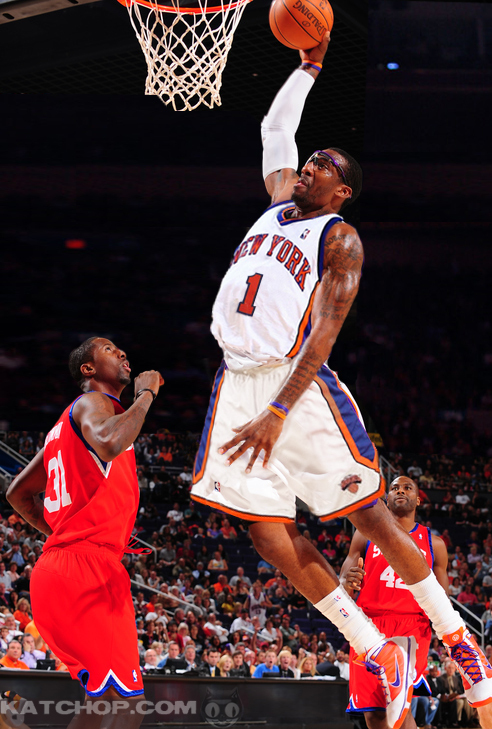 Amare Stoudemire (pictured above) has put the Knicks on his shoulders and led them to 8 straight wins. Can he keep the Garden buzzing with two major matchups vs the Heat and Celtics this week? It is Monday. And you all know what that means. It is the beginning of another amazing week in the wide world of sports. We got NFL action. College Football minutia and Bowl Madness debates. NBA Action. NCAA “totally awesome time.” MLB blockbuster signings. And we even got hockey hysteria. It is a great time to be a sports fan. 5. NHL Action continues on. And on Tuesday night, the battle for the state of Pennsylvania takes center stage. The two top teams in the League, the Pittsburgh Penguins and the Philadelphia Flyers square off in Philly. Can the Flyers make a statement and slow Sid the Kid and the seemingly unbeatable as of late Penguins? Make sure to tune in for this one. 4. So it is not the greatest week for College Hoops. There is only one matchup of ranked foes all week. This game pits #5 Kansas State vs #24 Florida next Saturday. But College Hoops are College Hoops. The unpredictability and excitement are always there. Plus, if the men’s game is not that appealing this week, you could always tune in and watch Geno Auriemma’s Lady Huskies continue to make history next Sunday at Madison Square Garden right? 3. The Bowl Game Madness begins this weekend. We got some barn burners set for Saturday. Here is a closer look. -New Mexico Bowl: BYU and UTEP square off in a hotly anticipated matchup. Okay, this game is not on everybody’s “to do” list, unless of course you attend or attended one of the schools. I am not quite sure how either of these teams find themselves in postseason play. But they both won the mandatory 6 games to get an invitation. Other than a 4 game losting streak early in the year, BYU has played pretty solid football. I expect their overall depth to prove too much against a UTEP team that are losers of two straight coming in to this one. BYU wins this very lackluster matchup by 3. -Humanitarian Bowl: A tough Northern Illinois team squares off with the always dangerous Fresno State Bulldogs. This is definitely the marquee matchup of the day. These are both pretty solid teams that have each taken down some decent foes this year. NIU had won 9 straight games until being shocked by Miami in the MAC Title game last weekend. The Huskies feature a special running back in Chad Spann. He is one of the best backs in the country that you have probably never heard of. Expect him to put on a show in his last collegiate game. Fresno State on the other hand has been extremely Jekyll and Hyde all year. I have not been able to figure them out. Sadly for them, I do not see their good side showing up in this one. Expect NIU’s blend of an outstanding rushing attack and a solid defensive unit to defeat the Bulldogs by 6. -R&L Carriers New Orleans Bowl: Hey, at least this game is being played in New Orleans. One of the most fun cities in America. Sadly, the caliber of the teams participating in this game are not the greatest. Troy has a lethal passing attack, but OU was a game away from playing in the MAC Championship. I am going to go with my conference rankings on this one. The MAC is a stronger conference than the Sun Belt in my eyes. Go with the MAC team. The Bobcats will win this less than stellar matchup by 9. 2. The NBA is full of major win streaks. Will they continue for another week? There are some great matchups as usual all throughout the upcoming week. Here is a look at the “key matchup” of each night. New Orleans at Miami: The South Beach boys appear to finally be getting it together. Winners of 8 straight. They look outstanding. Lebron and D Wade claim that they have figured things out. Well it appears that way. New Orleans on the other hand is a team heading in another direction. They are losers of two straight, and the hot start appears to be a mere memory. Can New Orleans cool off the trifecta in the heat of South Beach? Orlando at Denver: Orlando is no longer in first place in their division, or in the state of Florida. They trail the Miami boys by half a game. The Nuggets are coming off of a tough loss at MSG and appear to be in for more tough losses in the near future. It is likely that the Nuggets will be “Carmeloless” at any time now. So the Magic are dealing with the soaring Heat while the Nuggets deal with a star player’s outcry. Which team will overcome and conquer? Boston at New York: The two hottest teams in the East square off at the “Mecca.” Boston appears to be the cream of the East again while the Knicks have now turned into a playoff bound team. It is always exciting when a good team comes to Madison Square Garden. Which team will go cold first? Atlanta at Boston: Following a date at MSG, the Celtics head home the next night to take on a high-flying Hawks team. Will Boston once again show the Hawks that they are not quite at that “elite” level yet? Or will the ATL guys take another step in the right direction? Miami at New York: To cap off the week, one of the best rivalries of the late 90s is renewed. This is the first time in a decade where both teams sport winning records. And you know that Lebron always gets up to play in the Big Apple. You better believe that LBJ will not receive the warmest of welcomes. This may be the most hostile crowd he faces all year, outside of Cleveland. Are Lebron, D Wade, and Bosh up to the challenge of yet another very hostile environment? 1. NFL Football. Enough said. It is Week 15. There are teams looking towards next year’s draft. There are teams clinging to a last hope of desperation to make the playoffs. There are teams looking to secure home field advantage. And I could go on. Key matchups next week feature the Jaguars looking to stake claim on the AFC South against the Colts. The Jets looks to wake up after a two-week nap against the Pittsburgh Steelers. Could it be a rude awakening? And of course Green Bay heads to Foxborough to take on the NFL’s best team of the moment. There are also plenty of other things going on in sports as well. MLB Free Agency continues featuring the “Cliff Lee Sweepstakes.” The NFL impending lockout discussions continue. And of course there is High School Basketball going on in every one of your hometowns. So enjoy the sports for the week. It should be another memorable one. 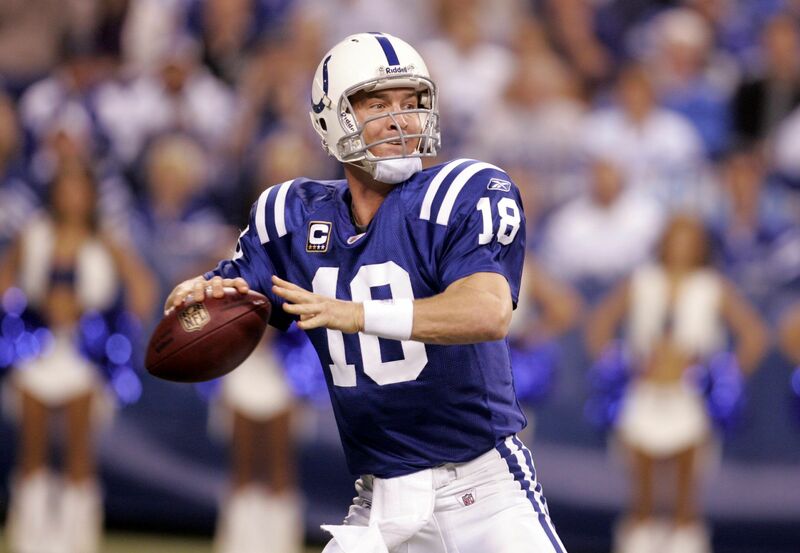 Superstar quarterback Peyton Manning is looking to lead the Colts to a 9th consecutive playoff appearance. Though I would love to talk about the TO Show arrival in Cincinnati, I will hold off and continue with my NFL Divisional previews. This is another division where 3 teams could easily win 8 or more games. A division that features a Colt’s team looking for redemption, a Titan’s team looking to continue to roll, and a Texan’s team still trying to get over the hump. Jacksonville Jaguars (4th place): I do see the Jacksonville boys ending up in the divisional cellar for the 3rd consecutive year. This team is not terrible by any means, but playing in the AFC South is no easy task. The Jaguars feature a middle of the road offense and a fairly sub par defense. In this division, a weaker defense will get lit up by a team like the Colts. Jacksonville has still not adjusted to the new look “pass first” NFL. Garrard is a decent quarterback, but Jacksonville has not shown enough confidence in the guy, which in my eyes has led to him struggling the past couple of years. Do not expect to see Garrard have an over 100 passing rating as he did in 2007. Now Maurice Jones-Drew has developed into one of the League’s elite running backs, but there is no compliment for him. There is no dual running back threat, plus the receiving corps is not the best, led by Mike Sims-Walker. Do not expect to see this team come out victorious in shootouts with teams like the Colts. Then on the defensive side of the ball, the Jaguars feature one of the League’s weakest secondaries and do an okay job at stopping the run. Can Daryl Smith at linebacker lead this unit to respectability? You better believe the loss of savvy veteran John Henderson is going to hurt. I do not expect this team to win more than 7 games, but I could see them stringing together 5 or 6 victories. Tennessee Titans (3rd place): Who cares if Jeff Fisher and the Titans are suing Lane Kiffin. Doesn’t it seem like everyone wants a piece of USC right now? This team has a strong offensive attack that features possibly the best mix of run/pass in the League. This is a differentiating factor that this team has in their repertoire. They can both run and pass the ball, and not just do one or the other in desperation. The Titans got off to a horrific start last year and fought their way back into contention behind the former Texas Longhorn, Vince Young. Expect this team to wake up from hibernation much earlier this year. We all already know about the Chris Johnson show. Last year’s League leader in rushing yards. Also, we know that this team has a compliment for Chris in Lendale White. Lendale truly pounded the rock on the goal line reminiscent to how the old bus (Jerome Bettis) used to do it in Pittsburgh in the 2008 season. Maybe Tennessee will return to this tactic if Chris doesn’t score from 70 yards out every game? But this team is definitely lacking a number 1 receiver. Kenny Britt and Nate Washington are solid, but neither is ready to be a number 1 receiver on a playoff team. Also do not be surprised to see former USC standout Damian Williams making some noise at the 3rd receiver spot towards the end of the season. But the real question is can this team’s defense hold their opponents in check? Most directions point to no. The loss of their defensive leader Keith Bullock will really sting on a defense that was already reeling. I feel that overall team defense and the lack of a number 1 receiver will cost this team a playoff spot barely. I see them finishing 8 and 8 or 9 and 7 though, but coming up just short. Next offseason they will need to get a number 1 receiver and improve the defense to really make a run at this thing. Houston Texans (2nd place): For a 4th consecutive year, I see these boys falling just short of their 1st playoff appearance in franchise history. I feel like this team is definitely good enough, but drawing the NFC East is the deciding factor that will prevent them from advancing on. The Houston Texans have a fairly punishing defense led by DeMeco Ryans and Brian Cushing (Cushing will miss the first 4 games due to suspension though). Easily one of the top 5 linebacking units in the League though. They also have guys like Mario Williams on the line who can really play. Do not be surprised if this team finishes in the League’s top 5 at stopping the run. The question is can their secondary do as well as their front 7? Offensively, this team has developed into one of the League’s elite. They fit the League mold of being a pass happy team. They have one of the most dangerous aerial attacks in the NFL led by their superstar Andre Johnson and quarterback Matt Schaub. This guy may be the best receiver in the AFC or the entire NFL. Can Kevin Walter step up as a big time number 2 threat to relieve some of the pressure off of Andre? I feel the play of Walter in the 2 slot could really make or break this team’s playoff chances. He needs to produce much better than he did last season. The Texans also have a solid running back in Steve Slaton, but will truly miss the production of Ryan Moats. Though this is a pass first team, it is truly a mystery who is going to step up and be the 2nd back. If Brian Cushing was not suspended for the first 4 games, and they were not matched up against the NFC East, I would have this team finishing 10 and 6 or 11 and 5 and easily claiming a Wild Card. I think they are very close to the Titans and they should finish within a game of each other. But I do see them coming out 9 and 7 and falling just short of the playoffs. Indianapolis Colts (1st place): The boys from Indianapolis will make the playoffs for the 9th consecutive year. The legendary career of Peyton Manning will continue to roll. This team still has the capability of putting up big numbers offensively, though last year the flash seemed to have disappeared. The Colts really did not blow opponents out, but did just enough to win. And believe me, Indianapolis was fine with their 14 and 2 finish and appearance in the Super Bowl. Their plus 109 point differential was only 5th in the League, even though they had the most wins. I mean who really cares though? 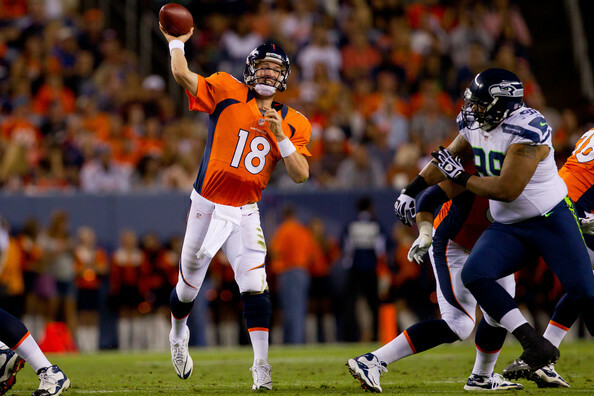 Peyton Manning does as good or a better job than any other quarterback in managing the game and spreading the ball around to all of his targets. He does not necessarily have the best targets anymore, but in Michael Jordanesque fashion, he turns them into stars. Guys like Reggie Wayne, Pierre Garcon, Austin Collie and Dallas Clark have really reaped the benefits. Who had ever heard of Garcon or Collie before last year? Joseph Addai is one of the League’s best running backs at doing what he needs to do to help his team win. He will not blow you away with his numbers, but he will do just enough. Also look for Donald Brown to carry more of the load than he did last year as he enters his 2nd season in the NFL. Then you look at the Colt’s defense and you have guys like Bethea, Session, hopefully a healthy Bob Sanders, and I could go on. The Colt’s defense last year typically bent, but did not break. And was a key in the 14 win season. Expect more of the same style this year. Also do not sleep on stars like Dwight Freeney and Gary Brackett. This is a solid defense that has the luxury of playing on a team that features Peyton Manning offensively. There are no dramatic changes to this team from last year’s AFC Champions. These guys are just tough and they know how to win. Never question Peyton Manning’s ability to win games. Expect to see these guys make another deep run in the playoffs. So there you have it, another year with the Colts on top. But also do not sleep on the Texans susprising some people and sneaking into the playoffs. If they did not have to play the NFC East this year, I would definitely have the Texans as a Wild Card team (sadly they play the NFC East). Should be a fun year in the AFC South.